This was the shocking, startling and overwhelming reality for first-time mother Sabine who, almost 17 years ago, stood in a hospital as a doctor gave her and her eight-month old daughter Monice an unknown, unexpected and life-altering diagnosis of West Syndrome. Since that day, after watching her daughter endure 300 seizures daily, endless EEG’s, lumbar punctures, and four months in a hospital, Sabine has cared and advocated for her daughter and managed her disability to the best of her ability. “We initially went to the hospital thinking she had a virus, and we didn’t believe for a second it would be life altering, but it certainly was,” Sabine recalls. “There were no answers in the early stages - just lots of tests and medical lingo that we had to learn, but then we were given the diagnosis of West Syndrome. “After that, all they could tell us about the condition was that outcomes ranged from completely fine, to full institutional care. “We felt traumatised and shell shocked - she was our first and only child and she was likely to now have some form of disability. Sabine was right in acknowledging the life-long change for her and her young family. Following the shock diagnosis Sabine gave up her job to support her daughter and give her the best care possible. The family immediately went from two full-time incomes to just one and Sabine experienced the isolation associated with living in the hospital beside her daughter for four long months. She had lost everything: her healthy baby, her identity, her career, some friends and ultimately even her partner. “The doctors delivered it all very harshly - they told us after four months to take her home even though the seizures were still happening, and said that Monice would never walk, talk or sit and was likely to have very limited function for the rest of her life,” Sabine says. While coming to terms with the hard reality of an unpredictable disability that sees five in every 100 infants and children with West syndrome not survive beyond five years of age, it brought out Sabine’s fighting spirit. “I decided that what the doctor told us was not the way it was going to be. 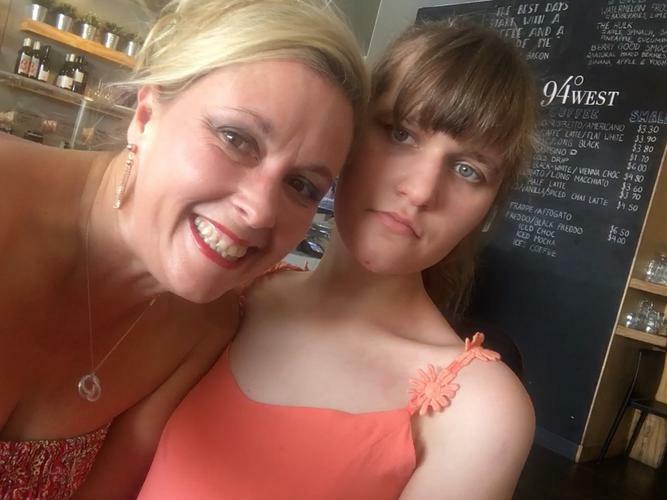 Today, at almost 17, Monice lives with Sabine virtually full-time, receives NDIS funding, a number of support services and is trying to enjoy life as a ‘young woman’, all thanks to the hardwork and determination of her mother and support of her family. “Now we have different challenges,” Sabine explains. “Now we don’t have a child, we have a young woman and I am pretty much her sole carer. I am making all these choices and decisions for her because she can’t do that herself. “I’m trying to do it as objectively as I can and with her best interests in mind. “We utilise respite on occasion to give her independence from me and for her to interact with people her own age, she goes on outings and camps with others her age. She still sees her father when and how he is able to. “I try to mimic what ‘normal’ young women her age do as much as I can so that she doesn't miss out on experiences because of her disability, but it is hard to find opportunities when they aren’t there for young people with high needs and their carers. “Like any teenager, Monice doesn’t want to spend all her time with her mother and I have spent years trying to find suitable carers, funding, programs, access, respite, camps and community programs all while being the carer with a full time job. “There are very few suitable programs currently available for young people with Monice’s level of care requirements which is sad given she is not alone. Sabine adds that as well as a lack of activities and programs for teenagers and young people with disability, there is a lack of opportunity to make friends. “Everyone needs friends but for a young, non verbal woman, it’s a very difficult process to find a program or activity where she has the opportunity to let people get to know her and she to warm to others. As well as the social concerns, Sabine says there are a number of day to day struggles that she, as the primary carer, faces with her teenage daughter. “Being a young woman, there are a number of gender specific and women’s health issues to consider,” Sabine says. “Complications with her personal hygiene needs, as well as incredibly high and low hormones around her period, led us to make the decision to put her onto contraceptive injections every three months. “This has been incredibly beneficial to her moods and made her personal care much more manageable for us and less unpleasant for Monice. The biggest daily struggle Sabine and Monice face is ill-equipped disabled facilities in public. “This is my bug bear,” Sabine says. “We have a companion card system which is lovely but if you need to change your teenager whilst out and about, I dare you to think how that happens. “Let me tell you it’s neither glamorous nor dignified. “Many popular venues have inadequate disabled facilities and sizing of toilets means myself, Monice and her wheelchair cannot all be in there at one time. “And then, there is no option but the disgusting floor. Sabine and Monice’s struggle is ongoing despite having been on the NDIS for a year now. Sabine says she had hoped that it would be easier and more fulfilling than their experiences with disability support in the past, but says there is still a lot of work placed on the carer’s shoulders, even with help of an overloaded plan manager to navigate some of the introductions. “Monice’s supports and services haven’t grown with her and in the system if you don’t fight, you are dismissed and ignored,” she says. “If you fit neatly and tick a specific box, I am sure the journey is different, but that’s not the case for us - it’s not our reality. “I am a full-time carer and a full-time worker and the workload for a parent in that position is phenomenal. “There are endless calls, appointments and advocating… but we hope that all the work and effort of getting a plan going and putting the infrastructure in place is correct and will give Monice better outcomes in her move from being a child to being a woman. “I am still fighting for her now, mainly to have age appropriate care, interaction and engagement. “She accesses respite, camps, after school programs and other supports, but we still need her to gain access to occupational therapy, speech pathology, psychological and behavioural assessment and therapy… these are all hard to access but we are getting there. “Some days you are just too overwhelmed and want to give up because it is too hard, but of course it’s only a thought because if I did give up, Monice would have nothing. “So, you get up and try again and keep knocking until someone will give into you. “I have never once been handed a service, it’s always me finding them and following them up. Sabine admits that accessing vital supports and services should not be this hard and that a lot of things need to change, but says as a parent and carer, she will continue to work as hard as she can and keep pushing. “We are working hard enough as it is, we shouldn’t have to work even harder just to gain access to information and basic services,” she explains. Having advocated for years to get the best for her daughter, Sabine encourages other carers to take control in meeting the needs of their loved one with a disability. “It’s up to you to research - the more you research the more you know to ask - so research. “Speak to everyone you know and ask what they access and where, go to free seminars and sign up to everything. “Even if it is wrong and it shouldn’t be all up to you, you must ask the questions, make them answer and not let them find an easy way out. “You have to chase and follow through with them, and if you don’t have the confidence or strength to do it alone, make it a two person job. Still feeling the “pang” of longing when seeing other young women reaching milestones that won’t be part of her or her daughter’s journey, Sabine says it is important for her to focus on her family’s changes and how far they have come. “I remind myself that even though it’s different, I’m extremely blessed to be a mum. “Monice, all in all, has developed well. “We have had our fair share of ups and downs with medications, food, diet… not to mention the hormones and behaviour! “The temper and tantrums I can tell you are no different in a young person with disability!” she jokes. “We have the same nature and relationship as any parent and child - a lot of interactions, though totally different, are a similar experience, just with challenges."